Patna, Nov 8: He graduated as an engineer but plunged into politics in the early 1970s. Sophisticated, soft-spoken and a teetotaller who detests tobacco, Janata Dal-United leader Nitish Kumar, known for his development and good governance, is all set to become Bihar’s chief minister again. Nitish Kumar’s experiment to ally with the Rashtriya Janata Dal led by former chief minister Lalu Prasad, and the Congress, was termed opportunistic by his arch rival BJP. During the assembly campaign, Nitish Kumar had assured the people that if he gets an opportunity again, he will serve them in the same spirit that he did for nearly 10 years. He had led the JD-U and its then ally, the BJP, to sweeping victories in one of India’s most populous and politically important states both in 2005 and in 2010, displacing his one-time mentor Lalu Prasad. Due to his vision and hard work, the then lawless, underdeveloped state was in the news for development, high growth rate and improved law and order situation. “It was the technocrat in him that reflected in his bid to develop Bihar and Nitish Kumar became a ‘vikas purush’ (man of development). Even his critics agree that he has been trying hard for a turnaround of the state,” says JD-U state president Vashisht Narain Singh, who has been close to Nitish Kumar since the 1990s. For one who for years worked under the shadow of the more vocal Lalu Prasad, Nitish Kumar could emerge as a leader in his own right only after he broke away to chart an independent course in the mid-1990s. His first stint in power in Patna was short lived. Becoming chief minister for the first time in March 2000 with the support of half a dozen ‘bahubalis’ (criminals-turned-politicians), he had to resign within a week after failing to prove his majority. 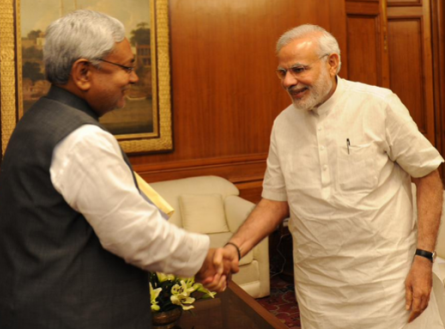 HAM to desert NDA in Bihar? Five years later, he was back in the saddle, thanks to an alliance with the BJP, a party he had courted since 1996 but whose Hindutva politics he strongly rejected. He ended the 17-year-old alliance after the BJP chose then Gujarat chief minister Narendra Modi as its face for the 2014 Lok Sabha polls. But the break-up proved costly in the parliamentary polls, with the JD-U reduced to just two seats out of the state’s 40 in the Lok Sabha. Nitish Kumar accepted responsibility for the debacle and put in his papers. He picked Dalit leader Jitan Ram Manjhi as his replacement. Manjhi was later expelled from the JD-U after he refused to resign. He formed a new party, the Hindustani Awam Morcha and joined hands with the BJP. As chief minister, Nitish Kumar went about rebuilding Bihar. He relaid roads that had virtually ceased to exist, built over 12,000 bridges, over 66,000 roads, completed long delayed infrastructure projects, appointed over three lakh school teachers to rebuild the shattered educational system and ensured that doctors attended health centres. He cracked down on criminals with strong links to politics. He ordered speedy trials and over 85,000 criminals, many of them politicians, were convicted. In no time, Bihar’s notorious crime rate dropped, so much so that young women began to venture out at night in many places, including state capital Patna. A teetotaller who detests tobacco, the widower has a son. He keeps his family away from the limelight, with his son Nishant Kumar out of politics. Born in 1951, Nitish Kumar was elected to the Bihar assembly for the first time in 1985. He became president of the Yuva Lok Dal in 1987 and secretary general of the then undivided Janata Dal two years later. He was elected to the Lok Sabha for the first time in 1989 and went on to win five parliamentary elections from Bihar. A minister of state in the V.P. Singh government, he became railway minister in the Atal Bihari Vajpayee government but resigned when a train disaster claimed the lives of about 250 people. He returned to the cabinet as minister for surface transport and agriculture.